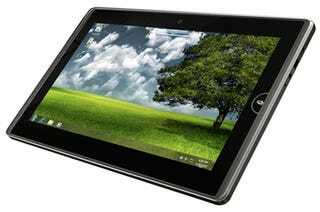 First, Microsoft's tablet hopes and dreams hinged on the HP Slate. That died. At least there were still rumors of the Courier dual-screen tablet! Until, well. But according to Microsoft honcho Steve Ballmer, there are Windows 7 tablets aplenty coming. Ballmer's remarks came at the opening of Microsoft's Worldwide Partner Conference today. It's not news that Windows 7 tablets are coming—Microsoft would be crazy not to be involved in the business, and we already know about the Asus Eee Pad—but the timing and scope are both surprisingly ambitious. In addition to Asus, Ballmer mentioned Dell, Samsung, Toshiba and Sony and Windows 7 tablet partners, with products on shelves "in the coming months." Ballmer didn't reference either the iPad or any Android or Chrome-based tablets, although it's clear Microsoft thinks they'll be able to dominate the market as they did netbooks. It seems as though Microsoft's main pitch is that they'll be IT department-friendly, although given that slates are largely content (and not productivity) driven, it remains to be seen how much of an advantage that will be.